Where you were born: Tulsa OK.
Where you live now: Tulsa OK.
most of my time there during the climbing season. (Cowell AR, Horseshoe canyon ranch etc). Go-To pump up song (currently): The Crazy Ones by Rezz. 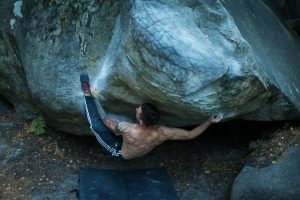 What’s your background in climbing? How did you get involved? I started climbing after I lost my sight. A friend who worked at the local climbing gym told me I didn’t need to be able to see to climb. I was skeptical, but after my first day of climbing I was hooked. After I lost my vision, I naturally didn’t want to give up the things I had done before going blind. So I continued riding BMX, playing soccer, and trying like hell to hold onto the things I once knew. The difficulty came when I would only progress so far. With most things I did, I would hit a roadblock that was either too difficult to overcome or impossible for a person with a visual disability. (I was getting hit in the face with soccer balls, running into the back of parked cars, you know, the usual). The thing about climbing is, I haven’t yet found a roadblock I can’t get past. How did you start climbing competitively, and were you always snagging the gold? I’ll never forget it. I was at the So iIl Showdown supporting a friend. After the competition, we all went up to the bar for the after party. There I met Amy, she noticed my cane and we struck up a conversation. She asked me if I ever considered competing after I had told her about my love for pushing my limits outside. I told her I didn’t think I would do well enough climbing against able-bodied climbers. She laughed and told me I would do better then I thought, then told me about adaptive competitions and that I should consider trying it out. We exchanged information and the next thing I knew I was headed to Salt Lake City for my first national competition where I took 2nd place. I went on to win the Adaptive National Championships 2 years in a row, and take a silver in my first world cup. 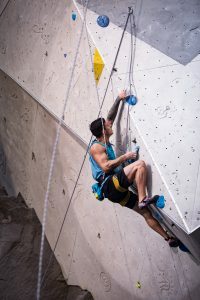 After all this, I competed in the 2018 paraclimbing world championships in Innsbruck Austria where I took home my first IFSC gold medal. 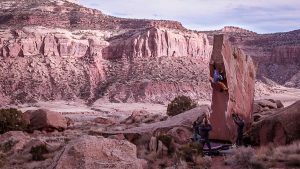 Could you explain the paraclimbing classification that you compete in? In comparison, there are 3 categories for the visually impaired. B1 for total blindness, B2 for mostly blind with some usable vision, and B3 for legally blind or better. I am a B2 climber. 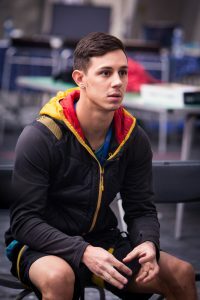 What was it like to get redemption at the IFSC World Championships this year? After my first world cup in Edinburgh Scotland I walked away with a silver. Of course, I was pleased with the outcome of my first international competition. But, I’m am a bit obsessive and a perfectionist. So I wanted to prove to myself I could do better. Couldn’t be more psyched on winning the biggest competition in climbing! Where are you now? What are you up to these days? 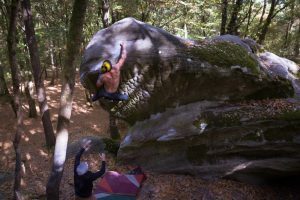 After competing in Innsbruck I headed to Fontainebleau France for three weeks to experience some of the best climbing in the world, it definitely didn’t disappoint. It was so much fun learning this unique style of climbing and growing as a climber in such a legendary climbing zone. Unfortunately, It was a little to warm to project really difficult boulders, so I set out to climb as many blocs as I could. It was a fantastic time running around with the crew doing circuits and sampling some of the most classic climbs in the world! Now that I’m back home in Oklahoma it’s time to start training for the climbing season and the projects I have left undone. SCENARIO: Your friend shows up to your door, he’s an escaped convict running from the fuzz. He tells you that he really needs a place to lay low for a while. By the way, your friend is a giraffe. Do you help him hide? If so, where? If not, why? First of all, his name is Steve, and he’s a nice guy once you get to know him. I’d probably tell him to take a hike this time. Last time we tried this I couldn’t think of anywhere for him to hide, so I just had him duck down behind the house. Unfortunately for Steve, you could still see his head sticking out over the roof. When the police knocked on my door and asked if I knew the giraffe hiding behind my house, I just said I don’t know what you’re talking about, I don’t see anything. Excellent! I am extremely impressed with the performance. A great interview!